Archbishop Emeritus Paul Cremona marked 50 years in the Catholic Church on Sunday, but also lost a brother who stood behind him when he was first ordained. Mgr. Cremona’s brother passed away less than an hour before the start of a mass held to celebrate his 50th anniversary within the Church. Mgr. 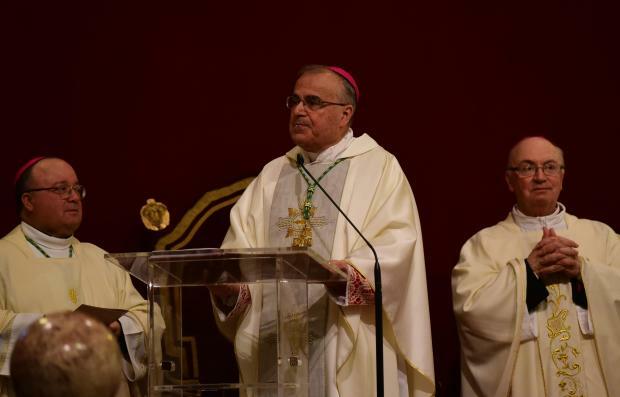 Cremona, who served as Archbishop of Malta between 2007 and 2014 before resigning in favour of Archbishop Charles Scicluna, was not the only cleric marking half a century since being ordained. Archbishop George Frendo, who leads the diocese of Tirana in Albania, also celebrated his 50th anniversary as a priest. “We grew up together as Dominicans, we lived parallel lives,” Mgr. Cremona recalled. Flanked by Archbishop Scicluna, Archbishop Frendo and Apostolic Nuncio Alessandro D’Errico, Mgr. Cremona used his homily to thank god for having adopted him as a son, and remarked that as a priest his dignity resided with the people he served, not himself. "I have dignity, because I serve you," he said. After his ordination in 1969, Mgr. Cremona served as prior of Our Lady of the Grotto in Rabat and obtained a doctorate in sacred theology. He went on serve as parish priest of Our Lady of Fatima parish in Pieta’ and Jesus of Nazareth in Sliema, as well as Dominican Prior Provincial.